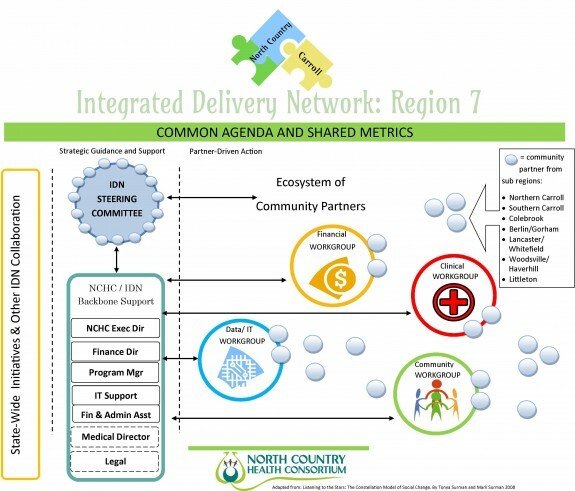 The Region 7 Integrated Delivery Network (IDN) Governance Structure was selected due to our large geographic region, and the wide variety of community partners participating in the IDN. The structure allows for geographic representation from the three involved counties, Carroll, Coos and Northern Grafton, plus the 7 sub-regions of the service area. The governance structure chosen consists of a Steering Committee and four workgroup committees. Each of these committees has their own charter outlining roles, responsibilities, and meeting structure. Financial Workgroup will advise the IDN Steering Committee regarding decisions about the distribution of funds earned by the IDN over the course of the demonstration. Clinical Workgroup will advise the IDN Steering Committee regarding clinical pathway standards, and how to monitor fidelity, performance, and patient outcomes of the Region 7 IDN. Community Engagement Workgroup will advise the IDN Steering Committee on ways to engage and inform the entire Region 7 IDN community and to gather input and feedback on improving patient outcomes in the region. Data Workgroup will advise the IDN Steering Committee regarding data sharing processes, utilizing existing technology, and identifying what is needed to implement standardized reporting and monitoring for the Region 7 IDN.